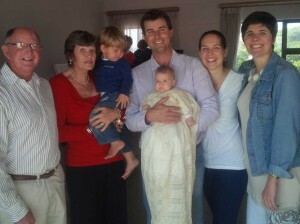 We practice both adult and child baptism (also known as ‘Christening’). Baptism is the way in which the church receives people into the family of God to live life in a new way and with new meaning. At the time of baptism, the person is making a commitment to follow Jesus Christ and will be formally received as a full member of the church, promising to support the work of the local church through gifts of time, talents, and financial resources. Parents who bring children to be baptised are making vows, before God and the community to bring them up to understand God’s purpose for their lives. These are not promises to be undertaken lightly. Recognising this, the church will, under normal circumstances, only baptise children whose parents are members, or regular adherents, of a recognized Christian community or congregation. Where such parents are not known to the minister, a letter confirming good standing, will be required from the ordained minister of their own church. Parents will be required to undergo a baptism preparation course (either at their home church or this church). If parents are not ready to make baptismal promises or wish to defer baptism until the child is able to make his or her own decision, the church also offers a service of Thanksgiving for the Gift of a Child. This service provides an opportunity for a family to give thanks for the birth of a child and to pray for God’s help in the child’s care and nurture. This service may be conducted by a Lay Minister and may be done in the parent’s home or other suitable venue. Because baptism is the indication of acceptance into the church community, the witness and welcome of the congregation is an essential part of the service. Therefore baptism is usually administered on a Sunday or other major feast days of the church, when the congregation is assembled for worship. This allows members of the congregation to commit themselves to support and care for the newly baptised persons and to help them grow in faith. 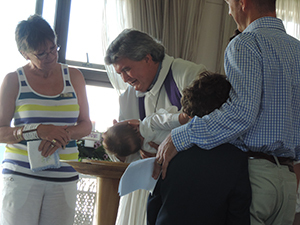 The service of baptism includes the reading of scripture; a sermon, the presentation of the candidates, and the affirmation of beliefs by the candidates, or in the case of children, those who represent them. The candidate is baptised with water and the words, “I baptise you in the name of the Father, and of the Son, and of the Holy Spirit”. The sign of the cross is then traced with water on the candidate’s forehead to show that baptism brings the gift of the Holy Spirit. The candidates are given a candle to represent the light of Christ and are received into the church community. Normally the service continues with the celebration of Holy Communion.